Trust in our children is the key to almost every aspect of parenting, but it’s especially essential at mealtime. Since children take their cues from us, our calm, trusting attitude will keep this channel between our child’s mind and tummy clear. Present a few healthy options, let go, let your children do the rest, and they will be able to stay in tune with their physical needs for food. The one thing that the many parents who contact me about food issues have in common – they are acting out of worry rather than trust. Remove “clean your plate” from your vocabulary. Don’t coax “just one more bite” or “here comes the airplane!” Take the safest, most child-centered route by offering small portions and allowing your child to ask for more. In the early months we must trust babies to communicate their needs and do our best to tune in and understand. Studies show that it is easier not to overfeed breastfed babies, because they have to suckle to get more milk, and they’ll usually stop as soon as they’re satiated. Bottle feeding requires even more attunement. The safest bet is to pay close attention and not give babies a drop more than they seem to “request.” Never try to overfill babies so that they’ll last longer between feedings. When introducing solids to babies, be mindful of being responsive, never directive. Always let the child lead. She knows her tummy, you don’t. Even pre-verbal children will let us know when they are hungry and when they’ve had enough — if we make it easy for them. Assure children that you want that information. Toddlers are often picky eaters. Some children remain that way. Even if your child eats next to nothing for a meal or two, trust him. When we panic, problems can begin. 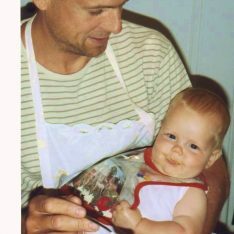 Infant specialist Magda Gerber recommended feeding infants on our lap to encourage attunement, attentiveness and intimacy. 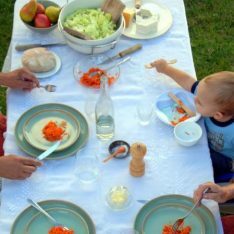 For the first few years at least, insist that children sit while they eat, whether you are at home, a friend’s house, the park, or anywhere else. This is a simple boundary that children as young as 9 or 10 months can understand and accept as long as you are consistent. Sitting is good manners, it’s safer than playing with food in your mouth, and it encourages focus on eating. Don’t show TV and videos to get children to eat. This, again, stems from worrying rather than trusting, and it creates the habit of not paying attention to food and his or her own tummy wisdom. 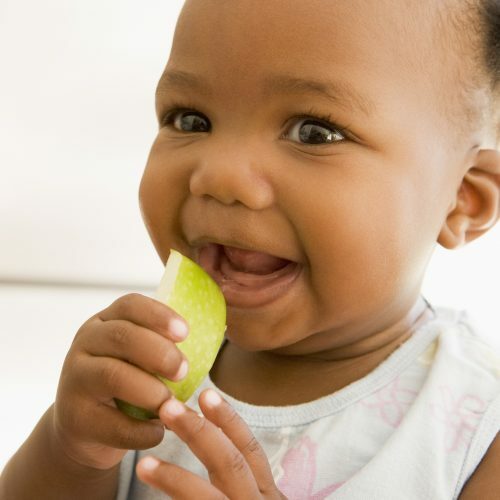 Be attentive to children whenever they eat so that they can stay focused, relaxed and refueled by both the food and your connection. This is the best way to enable continued “tummy listening” and will pave the way for togetherness at mealtimes for years to come. Just finished lunch with my two-year-old and wanted to say a big THANK YOU for the encouragement to make meals a time of connecting, with zero distractions or agenda about what gets eaten, firm boundaries around leaving the table, throwing food, etc. 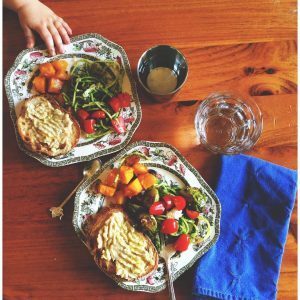 Carving out the time to eat together this way is easier said than done, but the effect is that mealtimes are going to be some of my favorite memories of this age with my son! For more, you might wish to check out the “feeding” and “mealtimes” sections here on my website. I also recommend the book: French Kids Eat Everything by Karen Le Billon. Thank you, Eryn, for sharing your story and photo! I’d love to get your input on Ellyn Satter and her “division of responsibility.” I’m a huge fan and feel that it aligns nicely with RIE, and I would be interested to hear your thoughts on it. Thanks, Grace. I have thoroughly researched Ellyn Satter’s recommendations, but what I’ve seen does sound aligned with Magda Gerber’s teachings, and I appreciate the simplicity of her explanations. I’m glad Satter’s work has been helpful to you. We have followed your advice very closely since day one and couldn’t be happier! Never had to coax. Throwing food happened maybe once. We are now at 27 months and family dinners are so relaxed. My son takes his time to eat and let’s us know when he’s done. Sometimes we even finish our dinner before him! My almost 1 year old eats anything and everything we give her but when she notices the food is almost gone she screams. I don’t think she’s truly still hungry because sometimes she’s eating the same portion as me, also after I clear the dishes, she stops screaming. I respond with something like, I hear you’re upset that your foods all gone but you’ll get to eat again later. She is still in a high chair because she doesn’t get herself into a sitting position otherwise I would try a weaning chair and table. Any other thoughts? I do try to implement this method as much as I can, but for example by bedtime when both my children ( 2 and 4) are very tired, I have agreed that I will feed them because it is a lot less stressful for all of us (and as a result, my personal boundaries are not pushed). So how do I reconcile these 2 things ie. respecting your own personal boundaries, and encouraging the independence etc? I know that if I just leave them to it, they may not eat anything and just go to bed crying because they are hungry. And when I feed them, I do try to make sure they are not oblivious of what they are eating – no screens or anything like that, and always check whether they have had enough etc. Thank you. Love this post. I do have a question. I do not force meals on my son (2) but I do tend to leave his plate for him to snack on. Sometimes he will eat and sometimes he will not. I encourage him to listen to his body and communicate with me when he’s hungry. However, we are struggling with him always wanting food at bedtime. I resist and tell him we already had dinner. He will fall asleep but then wake up several times during the night saying he is hungry and asking for food. I find myself trying to get him to eat more at dinner time to avoid being hungry in the middle of the night. What do you recommend when this happenes? Thanks, Kari. I”m wondering why you leave meals for your son to snack on. I would stop doing that and, instead, be clear that mealtimes are when food will be offered and that you’re fine with him eating however much or little he needs at those times. It sounds like this is unclear to him and he’s testing you. Thanks, Janet. I am going to try taking his plate away when he’s finished and see what happens! He’s a tester in every way so this is a good boundary I need to make clear. Thank you for encouraging us. I do feel badly not giving him food when he says he’s hungry at night but I’m guessing he’ll learn that he needs to eat when it’s meal time. She has a Facebook page called My Munch Bug. Her advice is spot on and much in alignment with your respectful parenting approach. We are just now tackling this issue with our infant. The tip about feeding him while sitting in my lap is brilliant. I’ll have to try this and see if it helps with this feeding routine. What do you recommend when your 2 or 4 year olds refuses to eat multiple meals and snacks (the 4 year old will not snack but the 2 year old will) to the point where 3 or 4 days go by and they’ve eaten less than what you can fit in the palm of your hand? Everything else is normal and no medical issues or concerns. They are both very picky and will not try any new foods, whatsoever. They each have probably 5-10 items that they will eat. I’m concerned that they’re not eating as it affects not only nutrition but their moods. You say it’s fine for a child to miss a meal or two and then they’ll start eating, but what if they don’t start eating any meals and go days without eating more than a few bites here or there? Hi Janet, thanks for addressing this topic. My 14 month old used to let me out her in her high chair for meals, but now starts to cry and resists getting in the chair and instead wants to eat sitting in my lap. Then she tries to put her feet up on the table, which I’ve tried to discourage. She will eat in her high chair at her grandmother’s (it’s the exact same model chair) where she goes during the day while we’re at work, she just won’t eat in the high chair at home. I’m unsure if this is a battle worth fighting because I want her to enjoy eating but I also want to model a respectful eating environment. Would love to hear your thoughts!